February 26, 2013 -- NSB Corporation has announced the release of NSB/AppStudio 3.0. It adds support for development on Mac OS and an IDE localized in 18 languages. "We've always wanted a Mac OS version", said George Henne, President of NSB Corporation. "It’s the complete product: every feature, field and screen in our Windows edition is present, with a true Mac OS look and feel. It runs great." AppStudio 3.0 also adds localized IDE support in 18 languages, including Arabic, Chinese, English, French, German, Indonesian, Italian, Japanese, Korean, Polish, Russian, Spanish and Thai. 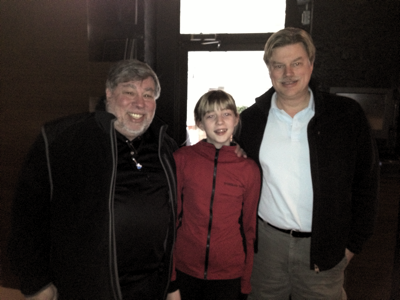 Montreal, Feb 11, 2013 - Steve Wozniak, originator of the first BASIC for Apple computers, and George Henne, the originator of the latest. Other new features in the release include support for jqWidgets, revised documentation and over 100 other improvements. Once apps have been tested in the browser, with a single click they can be deployed a device as a web app or compiled into a native app using PhoneGap Build.